This article was last updated on the May 2, 2018. In this article we'll take some time to discuss product validation in X, Pro and the benefits that come along with it. You do not need to validate your product in order to continue using it (will simply need to update the theme manually), however doing so will unlock many great features including automatic updates and access to Extensions. Without further ado, let's get down to it! Registration – We continually strive to provide a superior level of support to all of our customers. Product validation requires registration in the member center, which gives us the opportunity to assist new users if needed via the Knowledge Base, forums, and other resources. Legitimacy – As outlined in Envato's standard license and our terms, it helps us know that you have purchased a license to use for one website (i.e. one domain). Sounds Great! So Why Would I Want It? Product validation doesn't only ensure that we're assisting verified customers, it also unlocks goodies such as Automatic Updates. In X and Pro, you'll also receive the ability to install our Extensions on your dashboard. In Cornerstone, you'll receive access to our premium templates. I'm Sold, How Do I Set It Up? For X, Pro and Cornerstone, validation is a simple guided process. There are only a few steps you need to follow to get everything in order. 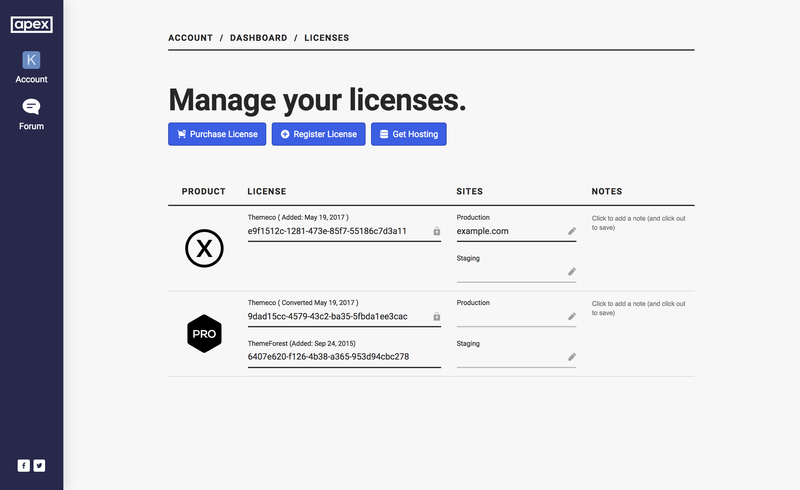 We'll walk you through validating your site, then introduce you to the licenses page for future management. Our product validation is built around the purchase codes provided by Envato when you buy a license. If you are unsure of how to locate your purchase code, this graphic will show you. If you purchased Pro, you can find your purchase code/license by navigating to Account > Licenses on Apex. With the purchase code in-hand, and X (or Cornerstone) installed, head over to the home page of the product you're validating. 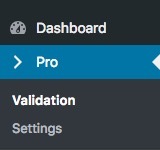 For Pro, go to Pro > Validation. You will be greeted by the unvalidated home page, with a "You're almost finished!" message. Input your purchase code, hit enter, and watch the validator go to work. It will interact remotely with our community site to automatically associate your site with that license within your Themeco account. When the code is a brand new. You will be guided through logging into an existing account, or registering a new one. If you're already logged in, it will confirm with you before proceeding to use that account. This step involves being redirected to our community site and returned to your dashboard when the account is set up. The code is verified in your Themeco account, and assigned to your site. This is already set up for all your existing sites via the old API key method and will continue working. The code exists in your Themeco account but doesn't have a site assigned. The site you are validating will automatically be assigned. The code is verified in your Themeco account but doesn't match your site. You'll be notified, and given a link to your licenses page to take a closer look. If you're validating X, remember that you don't need to validate Cornerstone, as it is considered validated already. Each X license purchase includes a copy of all of our Extensions for your optional use on one site. These are a combination of tools we have developed in-house and 3rd party plugins. We fully support each Extension as well as provide updates as they are available. Each of the 3rd party plugins are available for purchase directly from the makers of those tools only if you want direct support from the product creators or access to premium resources they may make available to their customers (your X purchase code will not allow you to register for support from the creator of the plugin). 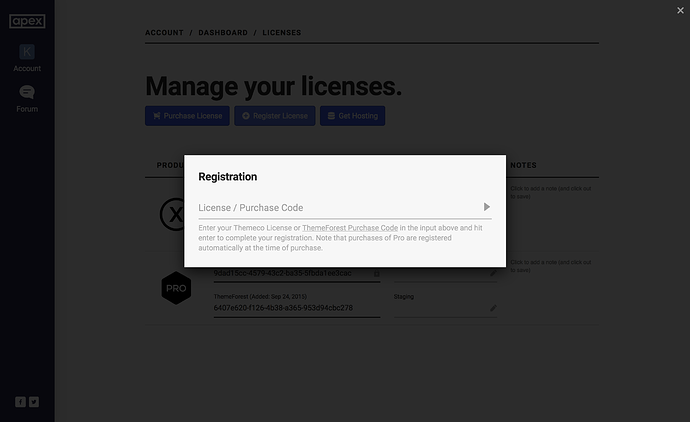 Keep in mind you are not required to purchase a license as the tool is provided with your purchase and supported by Themeco. 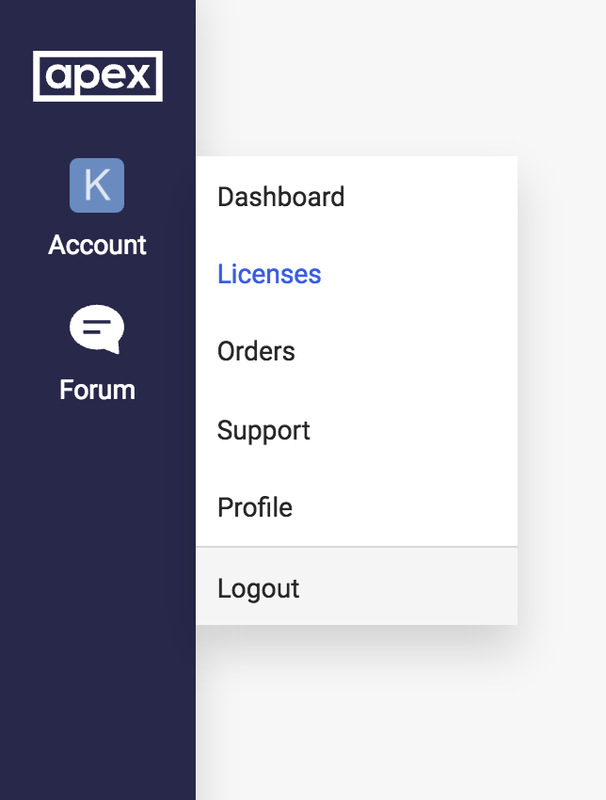 Upon reaching the licenses page, you'll see a table of licenses - each row depicting a license, along with what product is for, and details on any site(s) assigned to it. You can use the registration form to associate additional Envato Purchase codes with your account. This is optional, and useful if you want to verify licenses before they are used, but not required as licenses will be automatically verified when you enter them through the validation form in your WordPress dashboard. 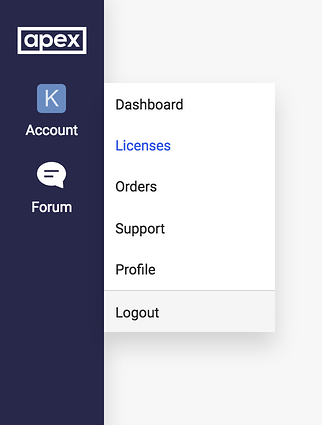 To access this form, click the Register License button in the header of the license management page, which will reveal a modal with the registration form. Enter your license there to complete the registration. Once again, this is automatically performed through the validation process described earlier, but you can manually create an assignment of a license to a site by clicking pencil icon next to the "Production" and "Staging" inputs under the "Sites" column and entering the site URL. This should be identical to the site URL field found under Settings → General of your WordPress dashboard. 1. Click the pencil icon next to the input you wish to add your site URL to. 2. The input will be focused automatically. Type in your site URL, and when you are done click outside the input for it to be saved. When you are complete, it should look similar to the following and your site URL will no be assigned to the license. On occasion, you may need to move a site to another URL. You can do this by un-assigning the site. Click the pencil icon next to a URL assigned to edit the contents of the input and remove the URL. Click outside the input to save and you will have successfully unassigned the site. When a site is assigned to a license, you will see the ability to add a Development Environment. Technically speaking, this works exactly the same as production validation to ensure predictability between environments. They can be assigned and un-assigned in the same manner as production sites, described above. Development environments require that a production environment URL already be assigned. Revoking the production site will also remove the development site. Cool, Now What Can I Expect? As updates become available through feature releases, you will now be automatically notified through them via the WordPress admin area. This can take up to 12 hours due to WordPress' built-in update schedule. If you are aware that an update is out but haven't seen anything for a while, you can go to Dashboard > Updates and select the Check Again button to force WordPress to look for any available updates. Even if you do not have product validation in place, you will still be notified of available updates in an effort to inform our users of when their theme is out of date and that they should update; however, you will not be able to have access to these updates automatically and will instead have to update your theme manually. If your product is validated, instead of simply being notified, you will be able to update your Themeco products and Extensions via the admin interface similar to how themes and plugins from the WordPress repository are updated. How to edit a template first before actually using it? Using Integrity theme for another website? Bought X - product key not accepted in the validation procedure! Word Press doesn't recognise activation code! Potential issues updating from 4.6.4 to latest release? How do I create a video at the top of my homepage? Do I need two licenses? How can I tell if I should bother installing a child theme? Paid for licence - but licence still not available since Aug 18th! How to move my X to a new URL? How do I check out other demo content than the one I'm basing my site on WITHOUT replacing the entire site? How to remove X from registered website? How do I update Cornerstone? What Plugins are Needed to Run X? PDF File with License information? Localhost create template Is the license required? Revolution Slider included with X theme? Can't validate license for cornerstone? How to transfer license to client? The same doubled license key in two licenses?